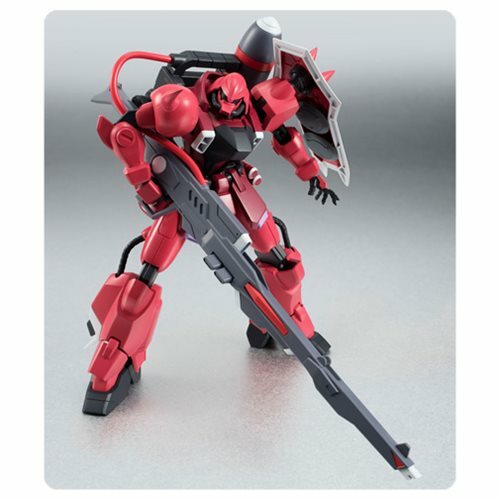 From Gundam Seed Destiny comes the Gunner Zaku Warrior in the crimson Lunamaria Hawke colors! Collectors of Robot Spirits will not want to miss this impressive addition to the line that even comes with the massive Gunner Wizard Pack mounted beam cannon! You can even choose whether to pose with or without the high powered beam parts, recreating your favorite scenes from the anime. The details don't stop there. Even the monoeye is fully adjustable. Set includes 6 interchangeable hands, Gunner Wizard, beam tomahawk, and beam assault rifle. Measures approximately 5-inches tall.